Surfing in Cornwall is fun and a good thing to try at least once. Experienced surfers head to Cornwall for some of the best places in the UK to surf and learning to surf in Cornwall is great with the beautiful sandy beaches and many surf lessons on offer. View our top ten places to surf in Cornwall below. ALWAYS CHOOSE A LIFEGUARDED BEACH TO SURF. Bude Cornwall is a very popular surfing town in Cornwall. There are a selection of beaches, coves and a harbour that provide a wide range of different wave types. There are great waves for beginners and some fantastic reef breaks for the more experienced surfers. Crooklets Beach in Bude is a small west facing beach set in front of the Bude Surf Lifesaving Club (the first club established in Europe) and favoured by a mix of surfers. Surfable waves form all the way along Crooklets beach. It is best when the south east or east winds are blowing and when the surf is between 1 - 5 feet in height. The shore break can break straight on to a pebble beach at higher tides so novices and beginners beware. Always check with a lifeguard where the safe spots are before entering the water. Sandymouth Beach is another great surfing beach at the North end of Bude. It is a National Trust beach with a beautiful cafe. The descent down the path can be difficult as the path gives way to a pebble ridge that descends to the sandy beach. When at the sand it stretches for just over a mile. The beach is watched over by beautifully high towering cliffs and a waterfall that children love to play in. The surf here is great but when it gets above 3 feet a little more experience is advised. The beach is only accessible at mid to low tide and so always seek advice before straying too far from the beach entrance. A real gem in the area! Also see Widemouth Bay described below for a good surfing beach near to Bude and excellent place to learn to surf. For surf lessons in the Bude area contact Freewave Surf Academy. They offer a range of fantastic surfing experiences such as taster surf lessons, surf safaris and surf & stay packages. Or their full day mini lifeguarding courses are also extremely popular as they teach young people the basics in aquatic first aid, beach knowledge, lifeguarding skills with a surf lesson too! Gwithian Cornwall and the nearby Hayle area offer some of the best places to come surfing in Cornwall and even some of the best surfing in the UK as they offer waves for all skill levels and, critically in the winter months, several options to take flight to when the exposed beaches are taking a battering. Gwithian and Godrevy Beach – lifeguarded in the summer months - are separated by the famous Red River, once stained red by Tin Mining waste, but now one of the cleanest, safest beaches in Cornwall. These Cornish beaches (both with views of Godrevy lighthouse), situated at the northernmost end of St Ives Bay, hoover up most of the swell that the Atlantic can throw at it and it’s rare for them to ever go flat. 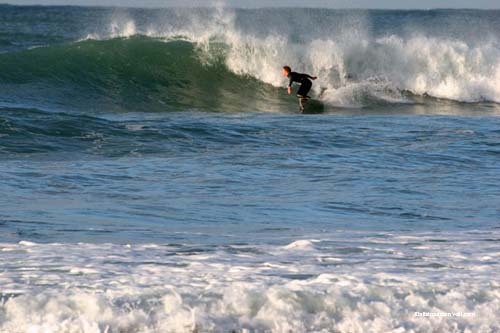 Gwithian in particular is very popular in summer with all levels of surfer making the most of her emerald waves. Gwithian beach is an excellent place to learn to surf in Cornwall and great place for a surf lesson as due to the gently sloping nature of the beach the surf forms and breaks very slowly giving aspiring surfers more time to get to their feet and owing to the generous ‘fetch’ of the Atlantic Ocean Gwithian Beach gets rideable surf year round. When the surf picks up then the other, less exposed, beaches start to get waves of their own. Heading down St Ives Bay towards Hayle you can find several other beachbreak waves with the most popular being in front of the access points at Beachside (often known as Sandy Acres) or ‘Site’ – in front of St Ives Bay Holiday Park. Hayle offers long playful waves for surfers of all abilities and the town has a fantastic surf shop with a huge selection of boards called Down The Line. Further down the Bay is Hawkes Point and Carbis Bay. These breaks only begin to show when Gwithian is being pummeled by huge swells or howling winds so it’s rare to surf them anytime other than the depths of winter. Gwithian really does have it all for a surfer. For surfing lessons in Gwithian and Hayle head to the Gwithian Academy of Surfing. They offer lessons for beginners and experienced surfers and a mixture of surf packages including sleep and surf options and two of their coaches have even coached the British Junior Surfing Team on a number of occasions. Or, if you just want to practice what you’ve learned you can hire surf boards and wetsuits from them. Sennen Cove Cornwall is a picturesque fishing village with breathtaking views out to the Atlantic Ocean - a beautiful destination situated on Cornwall's South Western tip with a glorious golden sandy beach. It is very exposed to the Atlantic Ocean and so gets the brunt of any swell coming. Sennen Cove is known as one of the most consistent surf spots in the UK. If there are waves to be caught they will be at Sennen. The South end of Sennen is perfect for beginners as it is sheltered by the break water and the waves are less steep with less power. The North End of the beach collects more swell and offers more power for more advanced surfers. 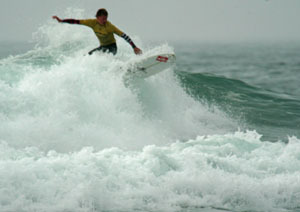 Smart Surf School is based at Sennen and offer group and private surf lessons for beginners through to advanced. Smart Surf's instructors are some of the UK's top surfers and highly experienced beach lifeguards. Click for more information on Smart Surf School. Sennen beach is very popular with local and visiting tourists due to it's beauty and the regularity of the surf. When it is good waves at the north end can reach up to six foot high. At the south end the sandbar creates smaller faster waves. Beware of the odd rip. Widemouth Bay is the most southerly of the Bude beaches. A beautiful long stretch of sand with large car park, a choice of cafes, surf shop and toilets. A very popular beach for a the family. Bodyboarders and surfers particularly like Widemouth Bay due to the space it provides in the water and shape of the waves that are created. The beach has a light gradient which causes the waves to break on it more gently. This is perfect for learner surfers and younger children. The waves break throughout the tide and are best between 1-5 feet and with an easterly wind. Widemouth Bay is a great place to learn to surf. For surf lessons at Widemouth Bay contact Freewave Surf Academy. They offer a range of fantastic surfing experiences such as taster surf lessons, surf safaris and surf & stay packages. Or their full day mini lifeguarding courses are also extremely popular as they teach young people the basics in aquatic first aid, beach knowledge, lifeguarding skills with a surf lesson too! The famous Fistral beach in Newquay is a very popular surfing beach in Cornwall attracting all levels of surfers due to the good waves it gets all year round with often challenging waves for more advanced surfers. A large wide expanse of golden sands means there is plenty of room to spread out, making it an excellent surf spot in Cornwall, although it does get very busy in the peak summer months. Fistral beach is the home to Rip Curl Boardmasters and many other national and international surf competition throughout the year and so it is a great place to watch some of the best surfers hitting the waves and join in the atmosphere and celebrations of a surf competition. Perranporth Beach in Cornwall is an amazing 3 mile long golden beach very popular with all types of surfers in Cornwall. Perranporth gets very busy in the summer months and it can be difficult to get a spot to surf between the relatively small flagged area set up by the lifeguards. Rips can be a problem at Perranporth so beware of this. The town of Perranporth also has some good surf shops and plenty of places to hire boards. Aside from the famous Fistral beach Newquay has other great beaches offering surfing, depending on the conditions. The town centre beaches of Great Western Beach, Tolcarne Beach and Lusty Glaze beach in Newquay are all popular with surfers, particularly learner surfers. The beaches all have facilities nearby although no parking - park where available in the town centre. Lusty Glaze Beach is a sheltered backed by steep cliffs. Lusty Glaze Beach is also home to The Adventure Centre and so also offers many pursuits aside from surfing. Popular with novice to intermediate surfers as often has waist to chest high waves. Adjoining Lusty Glaze at low tide is Tolcarne beach. Great Western beach is a sheltered sandy beach backed by cliffs. A good family beach that is popular with learner surfers due to it's smaller surf. At high tide most of this Newquay beach is covered by sea. High cliffs make Great Western beach shady in the morning. One of the Newquay town beaches it is about a 5 minute walk from Newquay town centre. There are toilets, a cafe and beach paraphernalia hire. Lifeguarded in summer months. Dog friendly beach all year. Read more about Newqay Cornwall. Slightly out of Newquay Cornwall Watergate Bay Cornwall is a two mile stretch of golden Cornish sands. Popular with surfers, kite surfers and beachgoers. Facilities are good with a couple of cafes, restaurants, beach shop, toilets and places to hire surf and beach equipment. Watergate Bay is home to the famous Fifteen restaurant set up by Jamie Oliver and the Extreme Academy. Parking can be tricky. The beach break at Watergate Bay makes surfing consistent all year and makes it popular with all levels of surfers. One of the five St Ives Cornwall beaches and overlooked by the famous Tate Gallery, Porthmeor beach is a popular surfing beach and also enjoyed by families and beach goers. Porthmeor Beach in St Ives offers options when the surf is large but it’s rare to get a wave over waist to chest-high during the summer months. Porthmeor is a large golden Cornish sand beach often washed by the white waves of the Atlantic, making it popular with surfers and body boarders. Particularly popular with learner surfers when other beaches have rough or high surf as Porthmeor can be more sheltered. There are toilets, a cafe and take away right on the beach and the centre of St Ives Cornwall is only a five minute walk away so facilities are excellent. The Tate Gallery St Ives overlooks Porthmeor. Park where you can find in St Ives and walk to this beach, this should take about 10/15 minutes depending which St Ives carpark you choose. Seasonal Dog ban 1st May - 30th Sept 8am - 7pm Lifeguarded over summer months. And when the north coast isn’t cooperating at all? Head over to Praa Sands or the other beaches that are only 25 minutes drive away could be firing. If the wind isn't good on the North coast you can drive over to the south coast and surf spots like Pra Sands and Perranuthnoe. September and October are great times to surf in Cornwall because the water has been warmed up from the summer and the wind is usually off shore which means nice smooth waves. The swell is relentless and the beaches less busy so catching waves wont be a problem. Cornwall really is a great spot for surfing because it has consistent surf and the choice of surfing both coasts if the the wind changes.